HowMechanismWorks ? : What Is The Purpose Of Timing Belt (or) Chain In An Engine ? What Is The Purpose Of Timing Belt (or) Chain In An Engine ? What is Timing Chain or Belt ? The timing belt is an very important part for the operation of car’s engine. However, timing belt performs a vital function by ensuring that the crankshaft manages the engine’s pistons, while the camshaft opens and closes the engine’s valves. rotate in sync.Similar to the way a bicycle chain connects the pedals to the back wheel the timing belt also a ribbed belt that is placed in a specific configuration along one side of your engine to keep the crank and camshafts timed properly. 1) The valves need to open and close at precisely the right moment to allow the intake of air into the engine, which in turn allows the combustion of fuel and production of energy. Incorrect timing can mean limited air intake and a compromised ability to burn fuel. 2) Without the timing belt, the pistons and valves fall out of sync and collide. This is a big problem, since the valves in your engine are very fragile and bend easily. One collision with the pistons is all it takes to cause a costly repair. The expected lifespan of your timing belt is specific to your car and engine configuration, usually between 60,000 and 100,000 miles.The timing belt or chain needs to be replaced per manufacturer's specification and can fail without warning which stalls the engine. 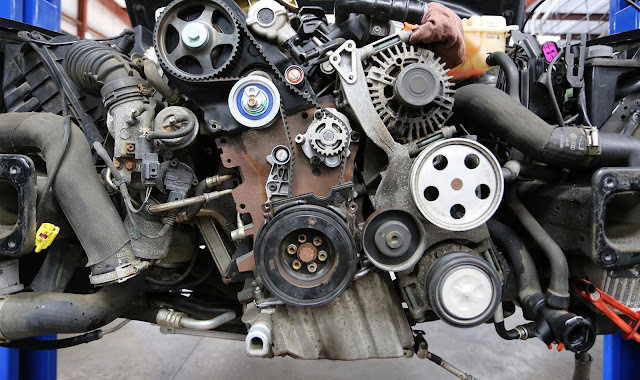 Because a timing chain configuration is more durable, a timing belt will need to be replaced more often, comparatively.However, if you're approaching your service interval and have doubts about the belt's condition, you might as well get it replaced a little early. It'll be less expensive than waiting until after the belt breaks.Some new car manufacturers, such as Audi, still use timing belts in their engine designs, but for longevity, many manufacturers have switched to metal timing chains that in theory last for the life of the engine. Changing your timing belt on a regular basis is a must.When a timing belt fails it will allow the ribs to shred stopping the driving motion. You have to take the car towed because it won’t start until the engine is “re-timed”, and the belt replaced. Because a timing belt is constructed of a fiber reinforced rubber with vertical ribs vulcanized to the inside of the belt. It has teeth to prevent slipping, which fit into the grooves on the end of the camshaft and crankshaft. It's a simple part for such an important function, and when it snaps, things get a lot more complicated.Unlike many car parts that gradually lose function as they wear out, a timing belt simply fails. Whether the belt breaks or a couple of teeth strip, the end result is the same. One minute, your car will be running perfectly; the next minute, it won't.